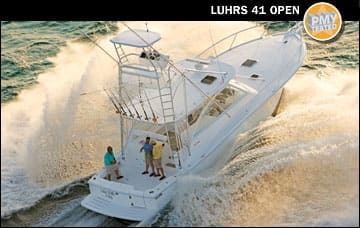 The prior night’s downpour had eased to a thick, humid mist as I made my way down the dock behind the Hall of Fame Marina in Fort Lauderdale, Florida, but even in the morning’s gloomy haze, the new Luhrs 41 Open looked inviting. And I was not the only one on the dock that seemed to harbor that opinion. 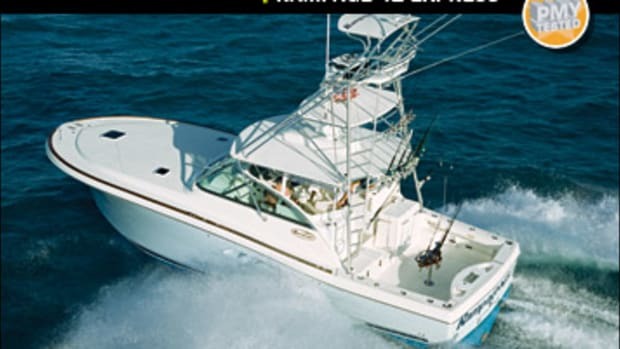 As I introduced myself to the Luhrs’ dealer, Capt. Sam Jaber of Scituate Yacht Company, we were approached by the owners of the boat in the slip alongside ours. 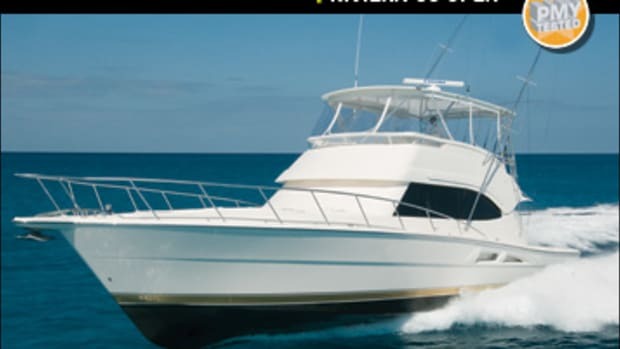 Docked there overnight during a trip along the Intracoastal in their own express cruiser, they were openly effusive in their admiration of the Luhrs, half-jokingly asking what Jaber might consider for an on-the-spot trade. 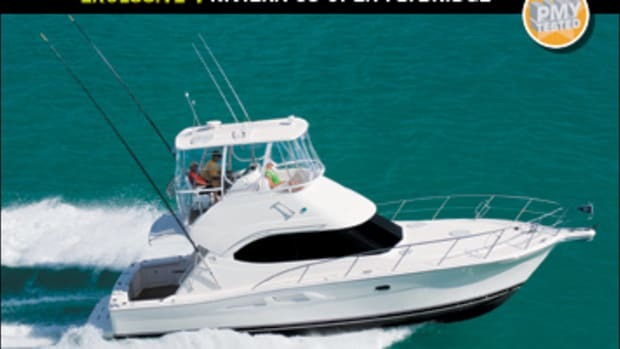 Considering the features of the 41 Open, it’s easy to see why she’s such an alluring prospect. 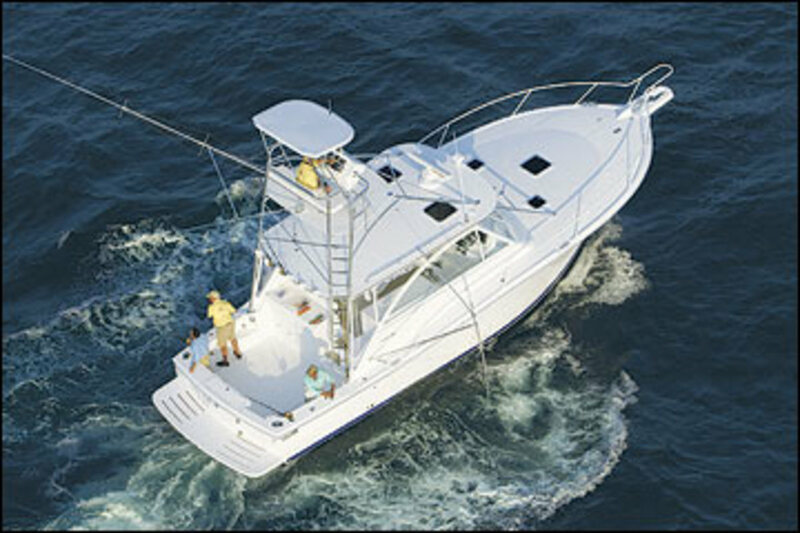 Though unmistakably intended for fishing, with a custom aluminum tower and a host of other standard fishing goodies, she’s just as nicely suited for cruising or day-tripping. 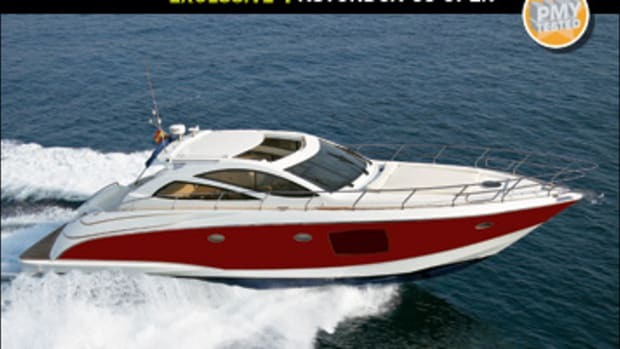 Indeed, her spacious bridge deck and roomy saloon are the rival of any express cruiser in her size range. To be honest, many of the features I liked on the bridge deck are optional, but the point is, they’re available and really transform the 41 into a great dual-purpose craft. 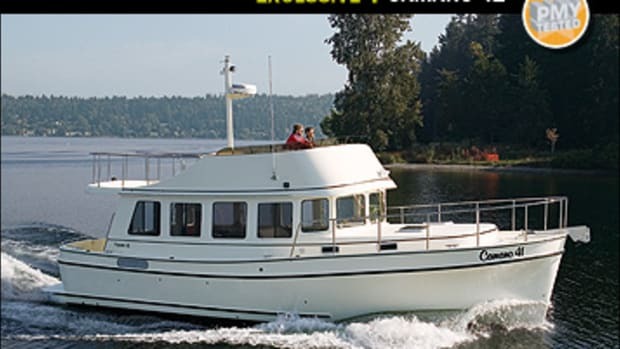 Certainly the most prominent option on our test boat was her Summer Galley. Mounted just aft of the helm, the nifty unit houses a barbeque, sink, and refrigerator/freezer, so meals and refreshments can be prepared outdoors on the bridge deck, just steps away from the cockpit. 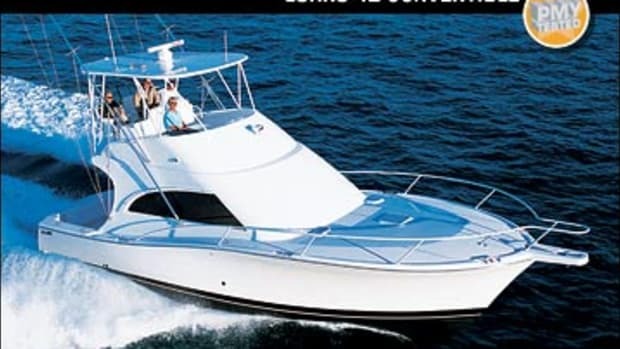 And speaking of cool features, our test boat was also fitted with an optional ice maker (tucked under the big double companion seat opposite the helm) and an optional 18,000-Btu bridge air-conditioning unit. With its optional three-sided bridge enclosure, the bridge deck becomes an all-weather haven that makes the galley and saloon seem almost superfluous. This is not meant to short change the galley and saloon. 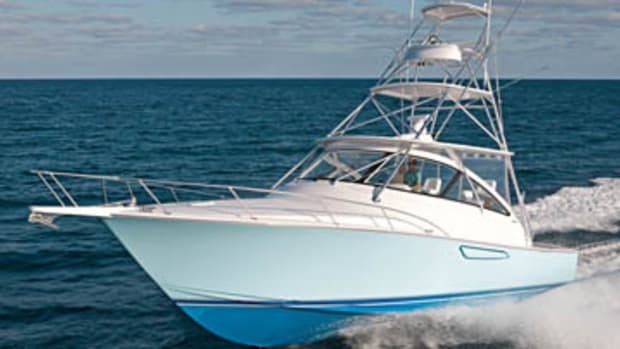 On the contrary, I found the compact galley well equipped, with a two-burner cooktop, an under-counter U-Line fridge/freezer/ice maker combo, and several well-thought-out features for stowing odds and ends. Beneath the sink is a slim cabinet that’s perfect for stashing serving trays, cutting boards, or the removable countertop sections that cover the sink and stove. And in the galley sole, there’s a 36”x17” hatch that opens into a 26-inch-deep space; extending several feet beneath the sole, the cavernous void is ideal for stowing bulky items. Another thoughtful touch is a bin for the trash can, recessed into the countertop just under the doorway to the bridge deck. However, I found it odd that the countertop does double duty here, serving as a top step of the stairway leading up to the bridge; it should at least have a pad of nonskid to avert a slip on a potentially wet surface. Opposite the galley, the saloon boasts an L-shape settee and a freestanding cocktail table. 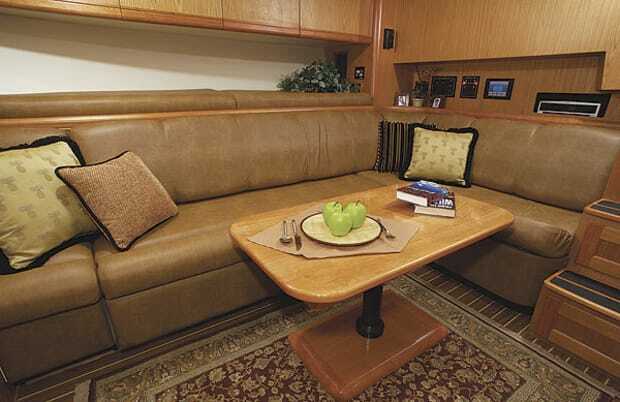 At the touch of a button, the settee extends into the saloon to form a 40-inch-wide berth. And with a bit of manual effort, the seatback converts into a Pullman berth of similar size. On the downside, however, this operation reveals a rather unattractive view of the hull sides and bottom framing; I’d expect a bit more attention to finishing details such as this on a 41-footer priced in the $700,000 neighborhood. And while we’re talking of fit and finish, I like the idea of a three-panel pocket door between the saloon and the master stateroom, but the execution was under par, with the panels rather loosely hung. I’d prefer more rigid tracks at top and bottom and beefier connections between the panels and their supports. In a similar vein, the port and starboard hanging lockers are a great idea, but hull curvature eats into much of the volume in the lower half of the lockers. I had no criticisms of the 41’s engine room. 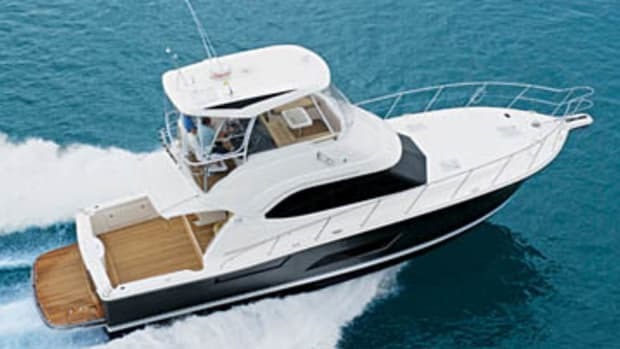 Unusual on a boat of this size, she offers nearly six feet of headroom along the wide walkway between her twin 645-hp Yanmars, along with easy access to all four sides of each engine. And her engines are mounted on massive steel beds welded from six-inch angle and tied into deep transverse webs at either end. The whole assembly is supported atop beefy 7”Wx11”D longitudinals. 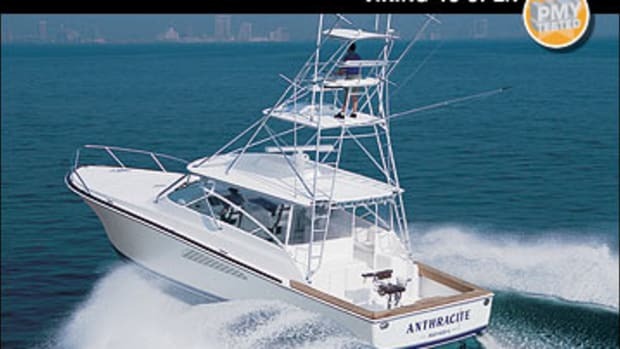 With the morning’s haze a distant memory, we fired up the Yanmars and headed out the Fort Lauderdale inlet. Winds out of the northwest had pushed up an ugly mix of two- to four-footers, but even at 30 knots the ride was smooth, with nary a hint of pounding. Rather, the bow seemed to ride very much into the water to such an extent that I double-checked with Jaber to make certain the trim tabs were fully retracted. Her hull tracked well into the seas, but with seas from astern, she tended to bow steer, and while re-entering the inlet (with seas astern), she nosed into the waves and sent a cascade of water over the bridge. Aside from her performance in following seas, she was stable and well behaved, and by the time we got back to the marina, the admiring couple we spoke with earlier in the day had moved on. But with the 41’s lingering allure, I’d wager that Jaber will be hearing from them again. Soon!